Educators will be evaluated on the four Standards of Effective Teaching as well as progress made toward achieving specific goals. Student Learning (SL) goals establish targets for student growth over the course of the evaluation cycle, while Professional Practice (PP) goals establish targets for educator growth. These goals will focus the action plan the educator implements throughout the cycle. Goals should be drafted after educators have completed an analysis of student data, considered school priorities, and completed a self-assessment. Each teacher must have at least one Student Learning and one Professional Practice goal. Educators in a department or on a team may share goals when appropriate. A shared goal, however, does not preclude a specific goal designed for individual professional improvement. Goals should be aligned so that student learning goals drive professional practice goals, i.e. achieving the professional practice goal should lead to achieving the student learning goal. Ultimately, goals must prioritize teachers’ areas of greatest need and be consistent with school and district goals. Goals should be SMART: Specific, Measureable, Attainable, Results-focused, & Time-bound. After goals are written and approved, the educator will provide more specificity in his or her action plan. Therefore, some of the components that make a goal SMART may be better suited for inclusion in an action plan rather than the actual statement of the goal itself. Based on the fact that less than 5% of students in SEI K2 currently recognize more than 20% of the taught Reading Street high-frequency words on the pre-assessment, my goal is that 85% of students will be able to recognize 85% of these words on the same assessment by June 1. In order to help students improve their oral language skills, I will increase the amount of student talk during mini-lessons from 10% to 25% as measured by the amount of time that students are given opportunities to “turn and talk.” I will measure my progress by asking another educator in my school to observe my class bi-monthly. A student learning (SL) goal needs to specify what your students are going to achieve – the student outcome – and how you will know how students reached the goal (how it will be measured). Based on the fact that _______ (x %) of students currently score ________ on the _______ (assessment), my goal is that by _________ (when) _______ (x %) will score ________ on the same assessment. Population: Which students will meet the goal? Learning Content: What is being taught over the period the goal covers? Will the goal apply to student learning of all content, or specific skills and standards? 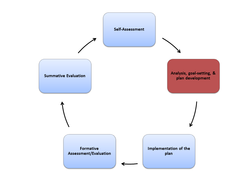 Assessment: What assessment(s) will be used to measure student progress toward the goal? Baseline: What is the starting level of students’ content knowledge? What are the baseline skills needed to learn the content? Rigor: How much student growth should be expected in order for the goal to be both challenging and reasonable? Target: What is the expected level of growth in student knowledge and/or skill at the end of the time period? Deadline: When will the overall progress toward the goal be measured? Next Steps: A goal that is really “SMART” requires an action plan that includes benchmarks for tracking progress and evidence of change/progress toward the ultimate goal. A professional practice (PP) goal names an action that is going to be taken by the teacher – something the teacher will do. Student outcomes do not need to be specified. The teacher’s action must be linked to the rubric – the goal should use terms that are in the rubric and should reflect the language in a specific Element (for example, should specify “differentiation”). In order to _______________, I will ____________________. I will measure my progress towards these goals by ____________. Rubric: Which element of the rubric is connected to this goal? Student Learning: How will achieving this goal impact student learning? Actions: What educator actions will be involved in meeting the goal? How frequently? Measures: How will progress toward the goal be monitored? Baseline: How does this goal relate to the educator’s current practice? Rigor: Does this goal push the educator’s practice while maintaining realistic expectations? Target: What is the expected outcome at the end of the time period covered by the goal? Next Steps: A goal that is really “SMART” requires an action plan that includes benchmarks for tracking progress and evidence of change/ progress toward the ultimate goal.